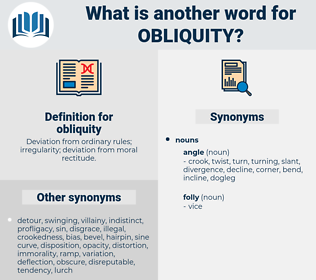 What is another word for obliquity? intelligence, seriousness, knowledge, carefulness, judgment, understanding, wisdom, sense, care. 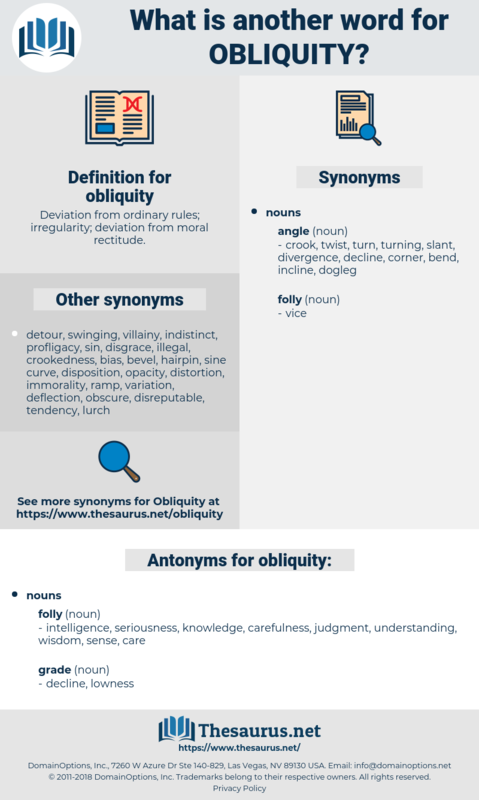 directness, visibility, incision, clarity, exactness, incisiveness, tangibleness, obviousness, clearness, lucidity, tangibility, perspicuity, openness, surety, Self-evidence, legibility, perspicuousness, forthrightness, explicitness, definiteness, readableness, readability, distinctness, Lucidness, palpability, plainness, certainty, comprehensibility, brightness, intelligibility, straightforwardness. In rare cases the obliquity of the fracture is downward and backward, and the lower fragment is displaced forward. Now the truth is that a Chinese, whose mind is formed, not by " religion" as we understand it, but simply by the intense pressure of " Old Custom," which we do not understand, thinks in a different manner from an European; moralists accuse him of " moral obliquity," but in reality it is a moral difference.